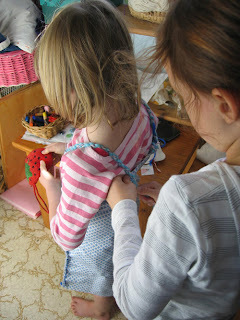 Chicken 1 fitting a dress she fashioned for Chicken 2 on Sunday, using found material, straps contructed with wool twisties (a skill learnt early in Steiner school) and sewn with thick blue wool. Chicken 2 is rapt!! Having the first official procrastination "study break" of my Graduate Diploma of Teaching and Learning. This course , being completely online, (yes I am now at uni, though it looks bizarrely similar to our messy study) feels totally unreal. However, there are lecturers in Darwin apparently guiding me through this process of becoming a teacher. Apparently one of these teachers, whose "lecture" I am attempting to read today, is very keen on using quotes from the Old Testament to exemplify the concept of "Student Assessment". Apparently, some biblical guys asked other biblical guys a rather unfair question, which resulted in the second bunch being unfairly slain. Eek. Lesson being, you've gotta get assessment right. Point taken. I start picturing my new lecturer, a woman, standing at the front of a sleek air-conditioned lecture room in Darwin, perhaps wearing a light batik cotton frock. I picture her trotting off to a bible study class on the weekend, fervently jotting down all the great quotes she can transfer to her lectures on education that week. Why not. I need a "study break".